The perfect fitness paddle for all swimming abilities! Tubercles, inspired by the Humpback whale fin, increase surface area along the paddle's edge, pushing more water and creating a smooth pulling trajectory. Contoured shape helps the swimmer feel the proper hand position for water entry. Improved tubing straps at the finger and wrist. 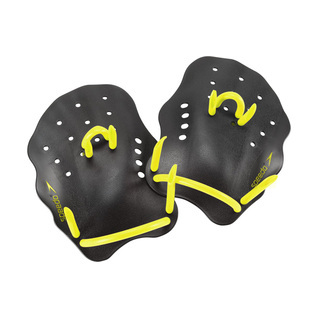 Use with the Nemesis Fins for the ultimate workout.